Keep up with the Ice Box World Tour in New York City. (or stick around and explore the Oakland Challenge). The Oakland #IceBoxChallenge results are in!!! Passive House Box : 78.5 lbs. California Code Box: 39.3 lbs. 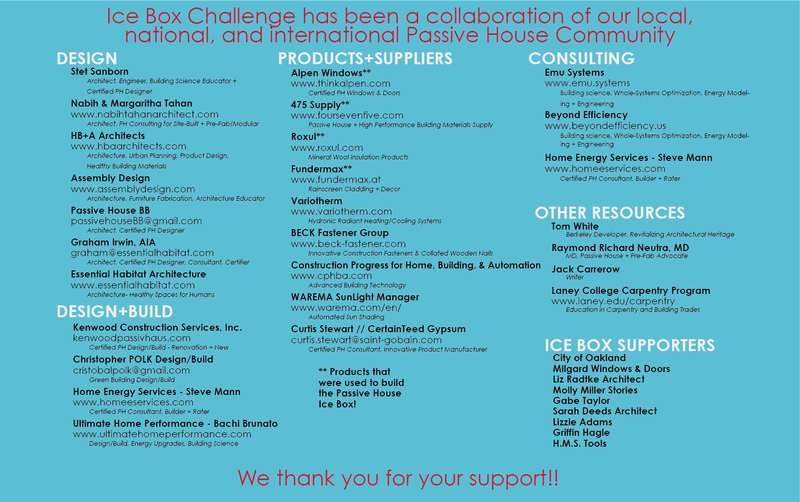 You guessed within 13.5 pounds of the Passive House box ice and 9.3 pounds of the code box ice making you the winner of the $475 prize! The #IceBoxChallenge is a contest and an experiment to demonstrate how a home can be super energy efficient AND comfortable. The Ice Boxes are left outside in the sun for 5 days. When they are opened, the amount of ice left in each box will be measured. How much ice is left shows how well each Ice Box keeps out the summer heat. Better building design can help us reduce our carbon pollution without changing our behavior. Energy-efficient homes are comfortable, quiet and healthy. High-performance buildings are reliable, affordable, comfortable buildings that use energy efficiently, so you’re heating or cooling only your home and not the outdoors. They stay comfortable and quiet throughout the year, including through summer heatwaves, winter storms, and power outages. The buildings use up to 90% less energy for heating and cooling than other buildings do, while maintaining good indoor ventilation and air quality. They are easy to maintain. They are also affordable to build, own, live in and work in. Passive House California promotes the international Passive House (Passivhaus) high-performance building standard as a simple, quality-assured approach to designing and constructing better buildings. As California quickly approaches a mandatory Net Zero Energy building code for new residential buildings, Passive House and the Passive House design principles will be essential tools to get us there. The Code Box has been built to meet the 2016 California Energy Code prescriptive measures for California Climate Zone 3. As California quickly ramps up their energy efficiency requirements, this design includes 2×6 insulated walls with 1″ continuous exterior insulation, and an insulated, vented roof. The windows were selected to meet the prescriptive measures as well. The Passive House box is built based off of designs for local Bay Area Certified Passive House Projects. Because Passive House is a performance based standard rather than a prescriptive standard, there is no one single design to satisfy the performance requirement. The box was built with well detailed insulation inside the 2×6 walls, 2″ of continuous exterior insulation which also runs continuously below the insulated floor and insulated roof, avoiding any chance for a thermal bridge. This box was completely sealed with both an interior and exterior air tightness membrane that was fully taped at all joints, providing air control to meet the strict Passive House standard. The windows are certified as thermal bridge free and provide the air tightness needed to meet the standard.